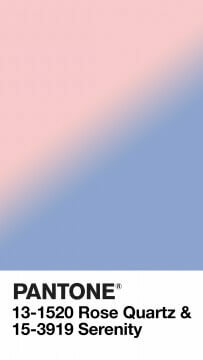 Pantone has announced its Color of the Year for 2016 and for the first time ever, the chosen color is a blend of two, Rose Quartz and Serenity. “Why two?” you might reasonably ask…. By choosing the combination of girl pink and boy blue, Pantone is making a socio-political statement too. For the graphic artists and web designers, Rose Quartz is Pantone 13-1520, #F7CAC9, and Serenity is Pantone 15-3919, #92A8D1. 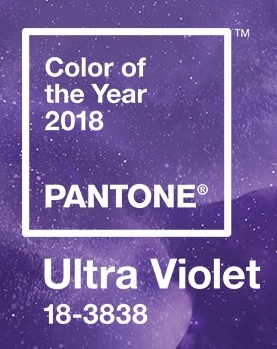 The full colour standards are available from Pantone. 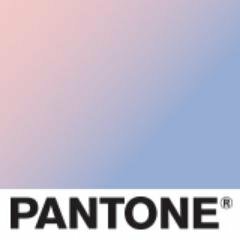 For fashion aficionados, Pantone has prepared a series of desktop wallpapers so you can really show off your cool color credentials. 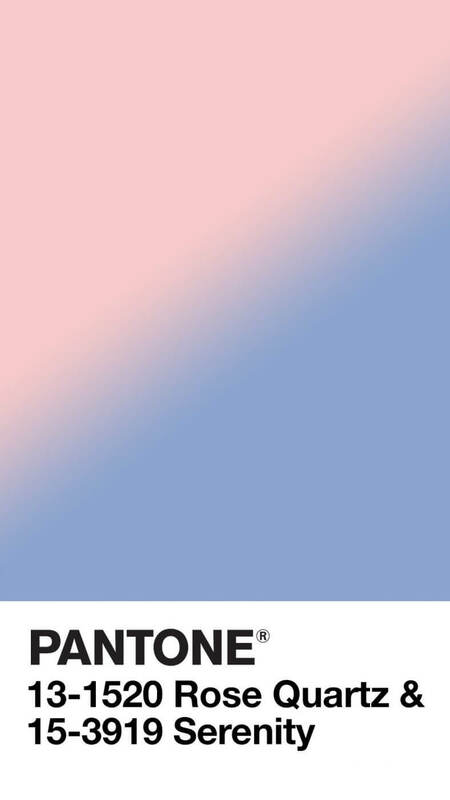 As ever, we can expect to see these Rose Quartz and Serenity incorporated into fashion and design over the coming year, though given the similarity to baby colors, it will be tricky to spot the real trends. Last year’s color, Marsala, is now officially out of favour. The colour data for Radiant Orchid is here, giving RGB and CMYK values for ultra-chic illustrators and designers. Web gurus should note that the HTML value is #B163A3. There’s a video discussing how the Colour of the Year is selected too. 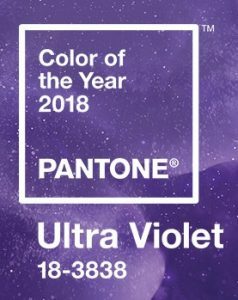 Pantone have the usual range of complementary accessories in the Pantone Universe (seriously!) including these fun Chip Drives, and the Spring Colour Report will feature Radiant Orchid prominently. 2013’s Colour of the Year was Emerald, “A lively, radiant, lush green, a colour of elegance and beauty that enhances our sense of well-being, balance and harmony” and 2012 was Tangerine Tango, “a spirited reddish orange, [which] continues to provide the energy boost we need to recharge and move forward”. Honeysuckle, from 2011, is a distant memory. 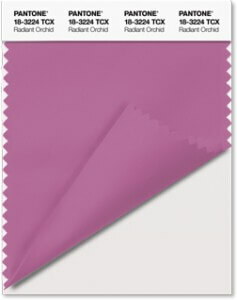 Perhaps Todd should incorporate Radiant Orchid into the next GNC redesign. Green is so last year. 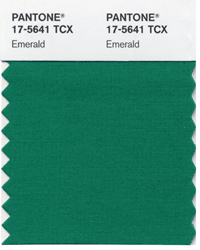 Pantone has announced the Colour of the Year and…drum roll please…it’s Emerald aka 17-5641. “A lively, radiant, lush green, a colour of elegance and beauty that enhances our sense of well-being, balance and harmony” says Pantone. The colour data for Emerald is here, giving RGB and CMYK values for illustrators and designers who want to be in with the cool crowd. There are several tie-in products, including Pantone’s Fashion Colour Report for Spring 2013, which showcases Emerald incorporated into the collections of several well-known designers, such as Tracy Reese and Nanette Lepore. From February, Pantone bedding, pillows, bath towels and accessories in Emerald will be available exclusively at JC Penney stores and on online. There are plenty of other accessories, including iPhone cases, in Pantone’s online store. Last year’s colour, Tangerine Tango, is now out. The summer superhero season is in full swing with Spiderman already in theatres and Batman returning shortly. Each superhero has their own outfit, both instantly recognisable yet disguising at the same time. Art Director Gidi Vigo has matched the key colours from nine superheroes to their respective RGB colours, so the next time you need some superhero duds, you know what to ask for. All images courtesy of Gidi Vigo.